I am very excited to publish my second installment of ‘Tulip Tales’! Baby Bella came into the world on March 14, 2013 with a poor prognosis. With the exception of seizure activity, she showed a flatline EEG and Neurologists said recovery was unlikely. Her mother, Lisa, shares her story. I had a normal, healthy pregnancy. I’ve always eaten extremely well, and taken care of myself. I worked out, avoided coffee and sugar. I was obsessive about it, I’ll admit. I had three ultrasounds, with the last being at around 32 weeks. All supposedly normal. I went into labour at 2:00 pm on March 13, 2013. Upon arrival at the hospital, it was concluded that I was only 3 cm dilated, so I was sent to the obstetrics ward to prelabour until I was 6-7 cm, then went back to the caseroom to deliver. I started pushing at around midnight. I pushed for a long time. The doctor used the vacuum at one point with no success. The baby was stuck on my pelvic bone. There were two occasions I remember them noting that her heart rate was dropping, so they had me roll onto my side, which fixed it immediately. No one seemed worried, so nor did I. 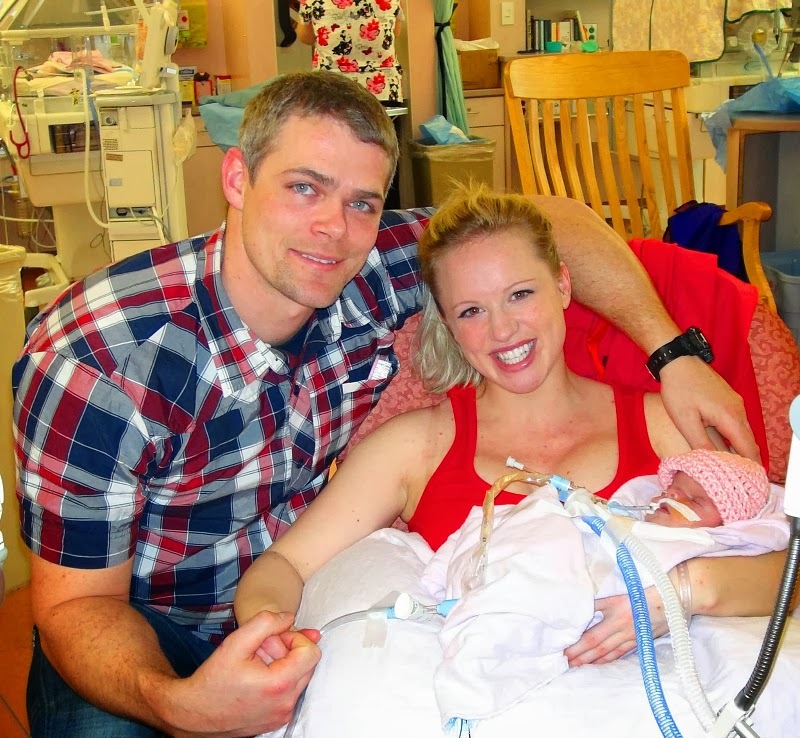 When she finally arrived, at 3:41am, March 14th, they whisked her immediately to the cot. We waited for her to cry. There was nothing. My mom has all of this on video. It still pains me to watch. We held each others hand as one doctor stitched me, and a half-dozen others surrounded her cot. No one was speaking. They then took her out of the room, but no one explained to us what was happening. We tried hard to remain calm and optimistic. Denial can be a beautiful thing. They brought her to me about 45 minutes later (also on video). They handed her to me without warning me that she looked different. 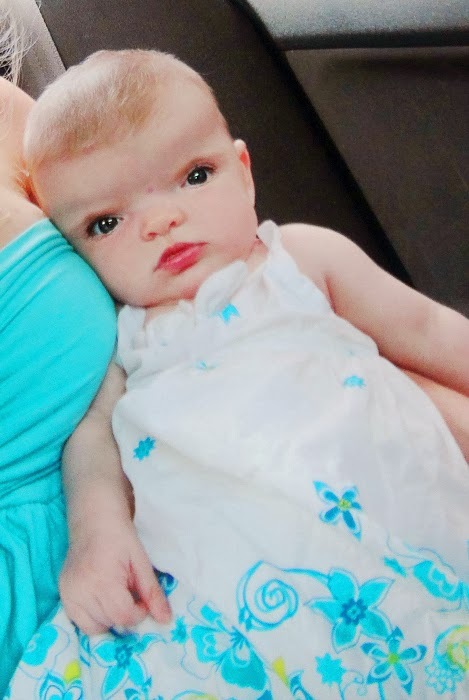 Her face and head where misshapen; microcephaly (her head was small, in the zero percentile), eyes spaced far apart, midface sunken, lacking brow bones. It was a heartbreaking moment. One I find hard to watch, yet I can’t bring myself to erase it. They told us she was having seizures, apnea, and likely had a syndromic case of craniosynostosis. They were not sure of the extent of damage to her brain, so they were going to do an EEG and CT scan. I lost my mind, basically. I’m usually a happy, quiet, calm person, but I was devastated. I remember repeating “I want to wake up. This can’t be real”. And I apologized to my husband for failing to give him a healthy child. My husband, I might add, was insanely stoic. He was so strong for me, but his heart was broken as well. The nurses gave me something to relax and sent me up to obstetrics. I cried until I passed out. I slept for maybe two hours, then got up and started researching until visiting hours commenced in NICU. When we googled craniosynostosis, we learned that there were surgeries that might be able to correct it. We decided “we got this”. We knew we could handle it, but we were terrified of what that morning’s EEG would show. I’m not religious, but damn it, we prayed. We were approached by a neurologist and two other people (can’t remember who they introduced themselves as). Our neurologist delivered the news quickly, emotionlessly, but tactfully. Bella’s EEG was a complete flatline with the exception of some seizure activity. I remember asking what the chance of recovery was, and his response echoes inside my mind to this day. “Highly unlikely“. My husband and I were shocked. Calm and methodically, it was then that we discussed whether we would keep her on life support despite her poor prognosis. We decided together that if she was capable of feeling happiness, we would do everything in our power to make her life as full and wonderful as possible. We then called our parents and broke the news to them. I remember there being tears, but there was also an eerie sense of calm. Again, denial can be a beautiful thing. 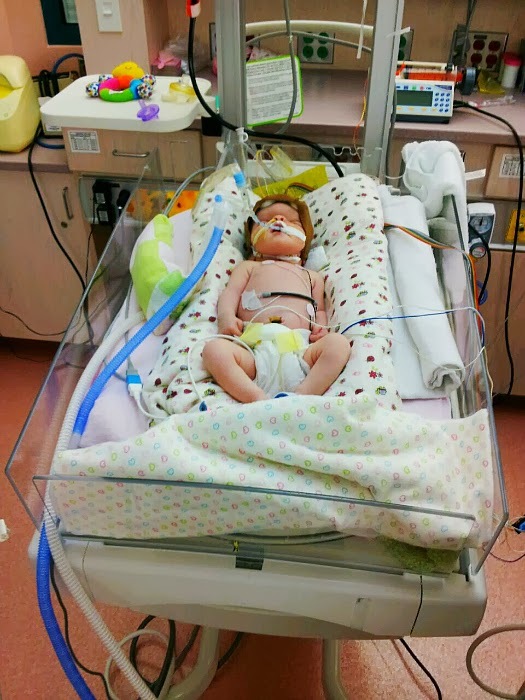 Bella was kept on intubation and an NG tube for the first few weeks. We stimulated her every chance we got. We didn’t miss a second with her. (Her grandparents as well. We all took turns). 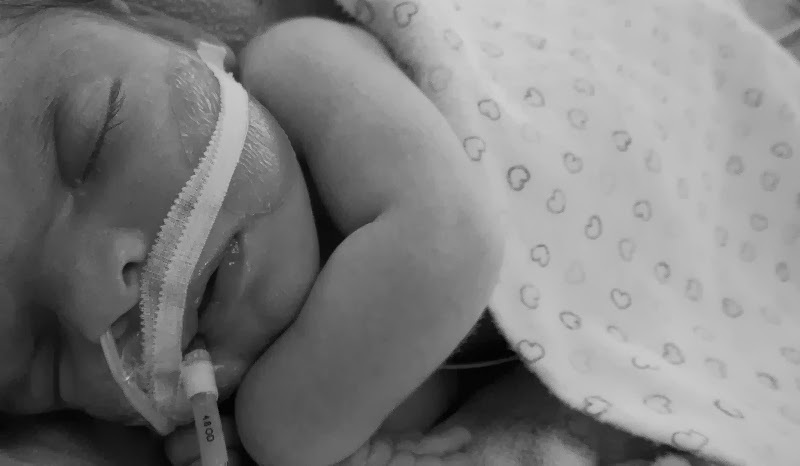 As the weeks unfolded, her breathing improved and the intubation tube came out. A few weeks later the NG tube was removed. Several EEGs were run over those first few weeks, each showing improvement over the last. An MRI was done at The Hospital for Sick Children in Toronto in October. It showed no legions relating to damage. Bella has hit all of her milestones until this recent screening. At ten months, she is not clapping, pulling herself up to sit or stand, crawl, nor does she pass an object from hand to hand. I am not overly worried yet though. It’s still early. The bottom line is, she is doing insanely awesome! We are so blessed. So thankful. Bella has a long road ahead. 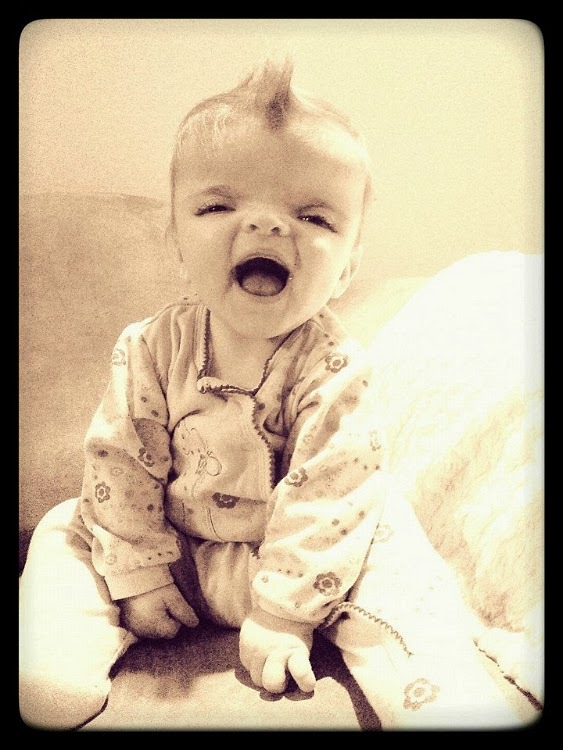 She has been diagnosed with a rare syndrome called Frontonasal Dysplasia. A minimum of four operations are in her near future; the first, a cranial vault distraction, to increase the volume of her skull to accommodate a growing brain (my husband and I will turn screws attached to hinges in her skull over the course of 6-8 weeks to increase its circumference). Then she will have a forehead remodel, a fronto-orbital advancement and the creation of brow bones, and a nasal bridge augmentation. All procedures will be repeated as required as she grows. No one can ever prepare you for something like this. But we continue putting one foot in front of the other. Every minute of every day. We derive strength from her smiles, her contentment, and the love in her eyes. Thank God for the little blessings. You are a true inspiration, Lisa. We wish you and your family all the best in the coming months, and we look forward to an update on Bella after her surgeries. Love to you all. * The financial cost of unexpected medical issues, and the related travel expenses can be an enormous burden to any family. To donate to Bella’s Journey, please do so HERE.